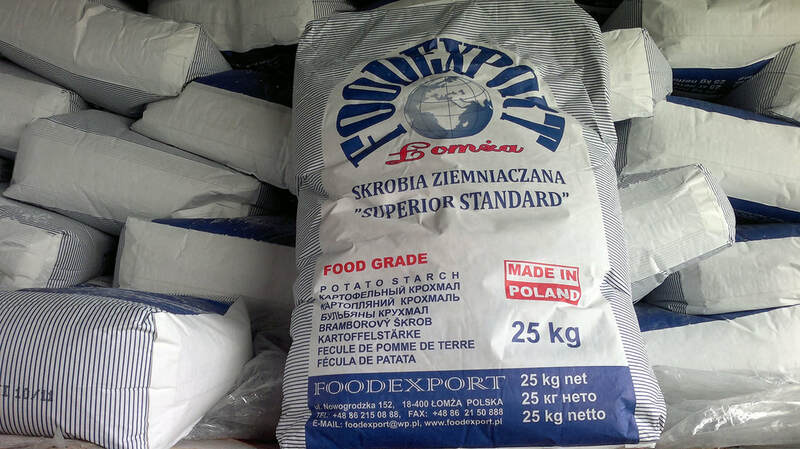 FOODEXPORT Company has been active on the Polish market since 2006, supplying food, pharmaceutical and fodder industries with starch products. 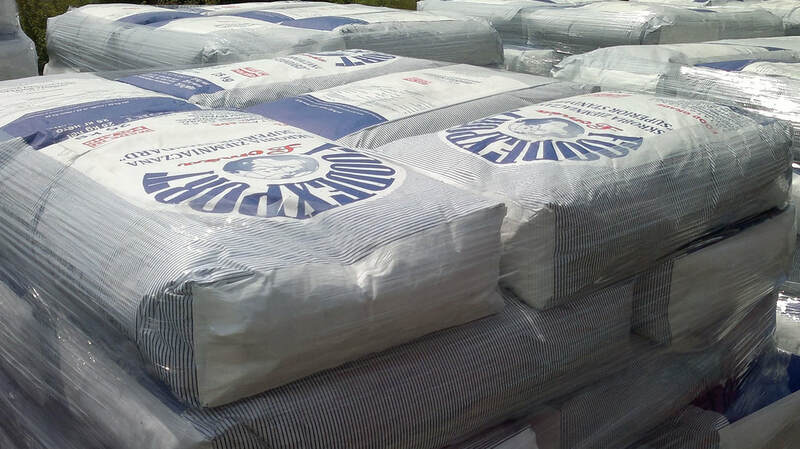 The Company specializes in exporting starch products. Our business contacts include Ukraine, Russia, Belarus, Uzbekistan and Kazakhstan. FOODEXPORT also actively sells its groceries in Latvia, Estonia and Lithuania. ​The Company offers technological consultancy on the use of starch products in food industry. As a distributor and partner for the leading Polish and international starch producers but also as an innovator, FOODEXPORT offers its own solutions. We choose starch of parameters appropriate for particular branches of food industry depending on the specific needs. FOODEXPORT coordinates forwarding and logistic services of national potato starch producers. It is provides also consulting services on company management that takes into account the market. It offers help in launching products onto the east markets and establishing distribution models. We focus all our energy on supplying our clients with the best products at reasonable prices, thus ensuring profits for both parties. Direct contact with each client - even with the smallest company - allows us to react quickly to market changes. Combining all the information, we can predict the development of the market situation and suggest optimum solutions. We achieve joint success thanks to logistic costs minimization, delivering our products to specific markets in optimum batches at carefully planned intervals every single time. As a significant and reliable partner, we provide our clients with the best supply conditions, buying large amounts of products. This gives us an insight into the production process and guarantees top quality of the goods sold to us. Starch is produced from special starch potato varieties. It is obtained by mechanical separation of starch grains from other parts of potatoes. Then, after purification, it is dried to 20% humidity. The final product is white, formless, tasteless and scentless powder, which is insoluble in cold water and pastes when heated to the temperature of 56 to 66ºC. Owing to its properties, potato starch has found a wide range of applications in many branches of industry. When the producer achieves the best quality of the product, we analyze the quality parameters, taking into consideration especially microbiology. If the product meets the high standards of our specification, we order the particular batch and pack it. ​Potato starch has various applications. In bakery, it is used as an addition to confectionery and as a bread ingredient which improves water retention and retards staling. In the production of concentrates, it thickens the powdered food. It is also used as a thickener of sauces, ketchup and mayonnaise. It improves the consistency of yogurts, kefirs, puddings and buttermilk. Potato starch is also used in textile industry to glue yarn together. In paper industry, it helps in dyeing, printing and paper finishing, as well as in gluing the paper pulp, glazing and bookbinding. In chemical industry, it is used in the production of glue, dextrin and explosives. Potato starch can also be used in cosmetic and pharmaceutical industries, where it helps to tablet medicines and plays an important role in the production of baby powder and talcum powder. Monostarch phosphate. A potato starch based product soluble in cold and hot conditions. ​OXIDIZED STARCH. A potato starch based product (also called pudding powder) soluble in cold conditions. Pudding powder is a product of potato starch oxidation. In food industry, it is used in the production of puddings and instant desserts. DISTARCH PHOSPHATE. E1412 is a product of starch cross-linking with the use of sodium trimetaphosphate. It is also based on potato starch and can be dissolved in cold and hot conditions. (This type of starch is characterized by stable stickiness and can be an ingredient of meat and fried products. It helps in stabilizing and thickening of heat-processed food, particularly of sterilized and pasteurized products. In meat industry, it reduces drip loss while heat treatment of meat, poultry and meat and vegetable products). ACETYLATED STARCH. A potato starch based product soluble in cold and hot conditions. ACETYLATED DISTARCH ADIPATE. A potato starch based product soluble in cold and hot water. It is obtained through chemical treatment of potato starch with the use of mixture of acetic acid anhydride and adipic acid. It is a food ingredient which, in the case of cold starch (CS), stabilizes and thickens pasteurized and sterilized products. ​In the case of hot starch (HS), it is used in the production of ketchup, powdered dinner concentrates, powdered ice-cream, mayonnaise, salad dressings, low calorie margarines, puddings, thermised cottage cheese and sweet fermented milk drinks heat-processed after acidification. ACETYLATED OXIDIZED STARCH. A potato starch based product soluble in hot conditions. Glucose is produced through enzymatic hydrolysis of starch. It is a white, fine-crystalline powder of sweet flavour. Glucose is a valuable, natural source of energy. Its consumption is especially important during increased physical effort and in the period of convalescence. Crystalline glucose is widely applied in the production of pharmaceuticals and dietetic products (like medicines or supplements). In chemical industry, it is a basic material in the production of sorbitol and citric acid. In food industry, glucose may be used to enhance the sweetness perception and the flavour of products. Crystalline glucose has found application in the production of confectionery, ice-creams, desserts, dry food mixes, non-alcoholic beverages, aswell as fruit and vegetable products. It is also a perfect substitute for sucrose in the production chewing and bubble gums. In the production of bakery goods, crystalline glucose is used as a natural ingredient that turns bread brown and helps to lengthen the shelf life of products. It is also a perfect food source for yeast and may serve as a filler and help to form an appropriate structure of the product. Adding glucose to beer and wine during their production speeds up fermentation and enriches the bouquet of wine. Moreover, glucose regulates the sweetness of powdered and fizzy drinks and beverages produced with the use of juice concentrates. In meat industry, it is an ingredient of brines used in ham production. A small amount of glucose added to icing sugar prevents its lumping and enhances its taste. Maltodextrin is produced from starch by enzymatic hydrolysis. It is a white powder of slightly sweet flavour. Its properties change according to the degree of starch hydrolysis. The higher the DE (dextrose equivalent) value, the higher the sweetness is, the higher the solubility and hygroscopicity but the lower the stickiness, bond strength and resistance to crystallization. Maltodextrin can be used as a binding and filling agent, it improves the texture and stabilizes the smell and flavour of products. This is why it has found application in the production of powdered food (ice-creams, sauces, soups, fruit extracts, flavoured crust), supplements and vitamin and mineral preparations for children and sportspeople. It is an important carbohydrate ingredient in modified milk and baby nutrient powders. In the production of confectionery, adding maltodextrin compensates the relative humidity and protects from hardening and crystallization of sugars. In the process of baking confectionery products, it allows for the regulation of stickiness, porosity and crumbliness of pastries, as well as gives them an appropriate colour and prevents from excessive drying. In the production of frozen cream and powders used in ice-cream manufacturing, maltodextrin suppresses sucrose crystallization, moderates sweetness and increases the freezing point. In nutritional and energizing drinks, it helps to increase the amount of dry extract, reduce sweetness and emphasize the effects of flavouring substances. Maltodextrin is also used as a carrier for colouring agents and aromas. In meat industry, it feeds the bacteria responsible for meat maturation. Belongs to a group of products rich in dietary fibre, which consists of polysaccharides. As a result, it stabilizes blood sugar level and may prevent diabetes. It is a source of iron, magnesium, zinc, potassium, phosphorus, calcium, vitamin B1, vitamin B6, folic acid and trace elements: selenium, copper, manganese and unsaturated fatty acids. Thanks to the above mentioned substances, dietary fibre may prevent heart diseases and hypertension. Dietary fibre is also believed to have estrogen-like and anti-oxidizing effects, whereas the psychoactive substances contained in it have antidepressant properties and help to fight nicotine addiction. Are rich in dietary fibre, whose addition into the diet helps preventing many civilization-related diseases. The high B vitamins content in wheat flakes allows to maintain a keen mind as these vitamins strengthen the nervous system. They contain almost 10 g of fibre per 100 g, which is connected with the fact that barley has the highest amount of beta-glucans out of all grains. This could have a positive effect on preventing constipation, flatulence and indigestion. It also lowers the risk of a heart attack and helps to reduce cholesterol. Beta-glucans also show antiviral effects, and thus they increase immunity. Barley flakes contain B vitamins, iron, magnesium, calcium, zinc, potassium, phosphorus, copper and chromium. The latter may stimulate insulin production and, as a result, regulate the concentration of glucose in the blood. Antioxidants contained in barley flakes, including tocotrienols, quercetin, selenium and phenolic acids, help in cancer prevention. W napojach odżywczo-wzmacniających pozwala podwyższyć suchy ekstrakt, obniżyć słodycz, uwydatnić działanie substancji aromatycznych. Maltodekstryna stosowana jest również, jako nośnik barwników i aromatów. W przemyśle mięsnym stanowi składnik odżywczy dla flory bakteryjnej odpowiedzialnej za dojrzewanie mięsa. Are recommended in slimming diets - they have been proven to be more filling than wheat flakes. They regulate metabolism and contain a whole range of dietary minerals (iron, magnesium, potassium, calcium, sodium, manganese, cobalt, copper, zinc, chromium, phosphorus, iodine, fluorine and boron), as well as B vitamins (B1, B2, B6, PP, inositol and pantothenic and folic acids) and vitamin E. Moreover, they contain lignans, thanks to which they prevent from cholelithiasis, from cardiovascular diseases and from breast, prostate and colon cancers.